Marilyn SanClemente February 26, 2017 February 26, 2017 All Occasion Card, All Occasion cards, handmade card, Handmade cards, Occasions catalog, Stampin' Up! Today I am sharing a card designed with the new Stampin’ Up! 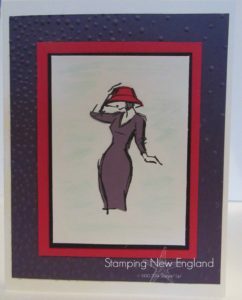 Beautiful You Stamp set to make a Red Hat card. This card was designed by one of my Downlines, Margaret. This is a quick and simple card made with Elegant Eggplant cardstock cut to 8 1/2″ x 5 1/2″ scored at 4 1/4″ to form the card base. The card base is embossed with the Softly Falling Embossing folder to add a little dimension. And of course since Red Hat Colors are Red and Purple there is a layer of Real Red cardstock cut to 3 1/2″ x 4 3/4″. Next is a layer of Basic Black cut to 3 1/4″ x 4 1/2″ and a layer of Whisper white cut 3 1/8″ x 4 3/8″. The image is stamped with Black Archival ink on the Whisper White cardstock. The lady is stamped a second time on a scrap of Elegant Eggplant cardstock and cut out to piece the dress on the lady. The hat is stamped a second time on Real Red cardstock and cut and pieced to the hat. When designing cards there are several common measurements to use for layering. A common layer is 1/4″ between pieces of cardstock. On this card, a narrow 1/8″ layer is used to mat the focal piece of Whisper white cardstock. Then a wider layer of 1/4″ is used between the Basic black and Real Red cardstock. I like the framed look that the difference in layers gives the folcal point of the card.